Simply stated, an energy efficient residential home or building structure is one that efficiently controls the flow of heat, air, and moisture that is coming in and out of the structure. A home is very much a “system” – multiple components that interact with each other, and contribute to the overall indoor environment. As lifestyles have changed, and technologies advanced, so has the desire to improve indoor environments. Essentially, that involves managing indoor air, heat and moisture, and doing it in a way that provides positive effects for the occupants. Today, the home as a “system” might well include all of the following components: outside weather barrier; indoor air/moisture barrier; thermal barrier (insulation); ventilating system; high-efficiency HVAC system; high-efficiency hot water tank; and thermal windows. Clearly, not every home includes all of the above, but serious efforts are made to incorporate as many components as possible during a renovation or retrofit. In the case of new home construction, all of these components are standard and commonplace – even based on building codes. Energy efficiency is highly dependent on proper attic ventilation. This is a process that allows stale indoor air to be expelled to the outside, while allowing fresh air into the indoor environment. A high efficiency HVAC system (heating – ventilation – air conditioning) is designed to provide this kind of proper ventilation, allowing for a balanced indoor environment and home comfort for occupants from season to season. However, optimum efficiency on any level will depend on the “system” working in sync – one faulty component can negatively affect everything. For those homes that are not as energy efficient as they can be, an energy audit can help to determine which areas are in need of improvement. A comprehensive audit can illustrate the difference between how the home is currently performing, and how the home might perform with improvements and enhancements. A good audit, handled by a professional, can set the stage for a variety of recommended upgrades, some of which are listed below. Making the home airtight, with air sealing products that restrict air and moisture movement. 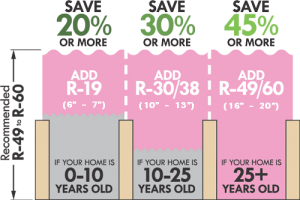 Improving the insulation quality and R-Value in the attic, walls, basement and crawl spaces. Installing (or improving existing) high performance ventilation hardware or mechanical systems. Upgrading the HVAC system to high efficiency (in some regions being rated as Energy Star). Upgrading the hot water system to higher efficiency, and installing “low-flow” plumbing. Today, many home centers offer countless products (and services) related to energy efficient home improvement – specially insulation products. And while some of these home improvements are within the capacity of the average homeowner, most are best left to the professionals, with experience and expertise in their field. 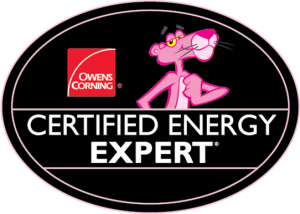 Many of the products require skill and knowledge, and many of the installations require proficiency and competence. For best results, and long lasting outcomes, its best to do the work properly the first time – and in this regard experience and expertise goes a long way.